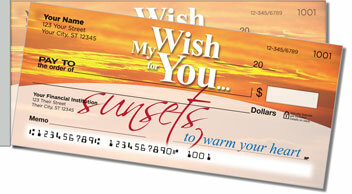 Stunning photos of a fiery sky at sunset, snow-capped mountains, a hazy rainbow and a placid kettle lake are the key design elements of our Wish for You Side Tear Checks. Overprinting these scenes of natural beauty are four insightful sentiments. 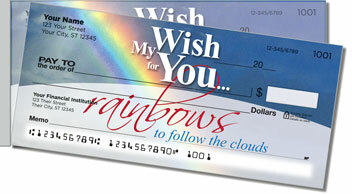 They'll spread your optimistic outlook every time you pay with a personal check! 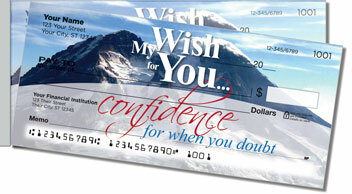 Plus, these checks inspire confidence with more than printed platitudes. That's because their short, left-side perforation makes for a trouble-free tear, so your checks won't rip in the wrong place when you separate them from the pad. 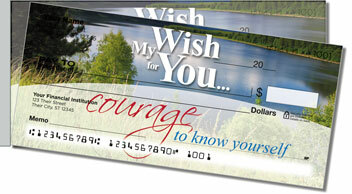 We also offer this inspirational selection as a set of return address labels to match your new checks. Personalize both products for yourself today!